Following on from that, I may automate the replacement with alternative hosting, but for this post - here's how to get a report from your site of where you are using Drive hosting. It finds googledrive.com/host/id style. If you are hosting gadgets on drive, then the url will be encoded, so it also finds them too. 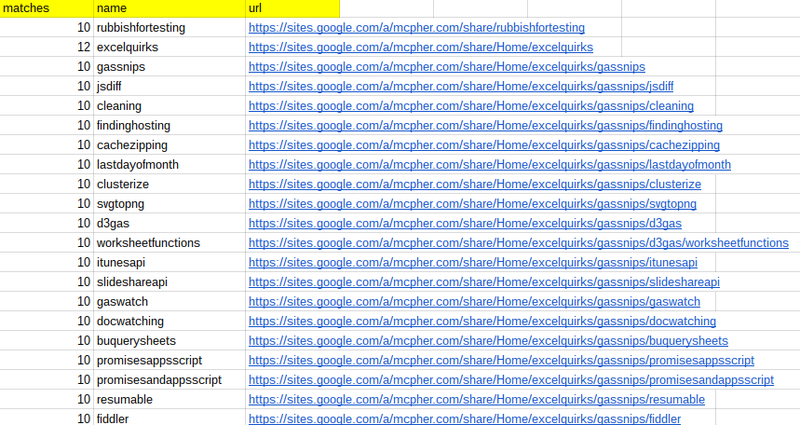 There are unsolved (maybe unsolvable) problems with rewriting html to Sites - specifically it can break gadgets, and will eliminate any of the deprecated Adsense gadgets (if you still have them on your site), so I'll need to figure those out (if I can) before publishing an automated update solution. One that has a summary of the pages needing attention. And another that has the detail of all the matches needing attention. The fileName will be populated if the hosting pattern involving a folder and file name is used, instead of the more common file id only. I'll be using the cUseful library, specifically this techniques. Here's the key for the cUseful library, and it's also on github, or below. Unfortunately, the getAllDescendants() method of sites doesn't work beyond a certain depth. I didn't bother to check why, so I'm just recursing through the pages instead, which sweeps up all the pages in the site. It's on GitHub, or below, or copy of developing version here. You'll need the settings namespace at the beginning of this post too and of course the cUseful library reference. // recurse for all the children of them. // if if does exist, create it.